#9: One crazy night on the lake! As the ground hog sleeps we all dream of warm weather. Sit back and relax and close your eyes and think back to last season and those warm summer nights. In an effort to get you in the mood for the upcoming season, I thought a look back at what I thought, from the broadcast booth, were the most memorable moments of the 2017/15th season of #FunWellDone. Remember this list is what stood out to me and is a matter of opinion from my seat. I am willing to bet your list may be totally different from mine or you might agree. Regardless, hopefully it will jog your memory and, most of all, get you ready for the 2018 season and the great season ahead. I tried to avoid crushing losses (except when memorable) as they are parts of the twist and turns in the season. When someone asked me about the season, this would have been what I would remember if I was forced to write a book on the topic. My number nine moment stands out for a couple of reasons: First, it was part of my return to Gary SouthShore, a place I had spent the previous five years, and second, it had all the makings of just one of those games that you just don’t get anywhere else but in the minor leagues. It might even be a case of “just when you thought you had seen it all, well, now this.” Part of the reason I love this game and the opportunity to be your eyes and ears is that you just never know what excitement lies ahead each night! At the time of the season, the T-Bones had fought back from an early 1-5 start to the season and were approaching .500. This win would give the club a three game winning ride and pull the team to just a game below that mark at 5-6. On the scoreboard it was 11-0, but as I wrote the headline that night—“The Kansas City T-Bones ran their season-long winning streak to three games with a 11-0 shutout win over the Gary SouthShore RailCats on Tuesday night in Indiana”—that was the easy part of the story. Toss in two rain delays and some bizarre plays, and it was one crazy night on Lake Michigan. To start, that evening Joe Jackson was tossed in his first at bat in the second inning. He would be replaced in left by Patrick Brady, a change that forced into play Marcus Lemon who went to second for Brady as Lemon was originally given the night off. We did not know then, but both players would figure heavily in the outcome. It happened so fast that there was no infield fly, or in this case, a line-drive call, and as the rule states, the runners held and did not advance on their own. But the players were forced to advance once the ball hit the ground. I got to know John Holland while in Gary. He is a smart player, and to this day I think it was both a great reaction on his part and maybe some good acting? Either way, it worked. There was no clear umpire gesture or fly rule, which surely had to be the case, but then again, the runners moved on their own, so the end result was the two outs. Crazy! In the bottom of the inning, Gary had runners at first and second with no outs. With the corner infielders playing in, Randy Santiesteban slapped a ball through the five and six hole to left field. Patrick Brady, who moved to left field because of Jackson’s ejection, threw home as the RailCats tried to score, getting Ryan Fitzgerald out at the plate. Christian Correa threw to third to get Holland, who tried to move to third on the throw home. The scoring was a rare seven-to-two-to-five double play. In my book it read 7-2-5. Kansas City would get all the runs they would need in the top of the fourth. Daniel Rockett drove in the first run of the game with a two-out RBI single. Christian Correa followed by hitting a deep ball to center that RailCats center fielder Chase Harris could not flag down. Harris hit the wall hard and tumbled into the warning track and lay flat on the ground. Correa raced around the bases for a three run inside-the-park home run. What makes the story even crazier after the Correa inside-the-park dash is this nugget: The inside-the-park home run came on the same day, May 30th, that former T-Bone Geoff McCallum achieved the same feat by hitting the first pitch of the game for Kansas City in a 2008 contest at Schaumburg. That night, left fielder Alfred Joseph slipped in the wet conditions, allowing the ball to roll to the wall. In an additional twist, it also happened to be against the same a club now owned by RailCat’s ownership and now a member of the Frontier League. What are the odds of that? Third base coach Bill Sobee and I laugh all the time about the weather in Gary. One year they pulled the tarp 40 or so times in 50 days! So why not add some rain to this crazy evening? The game had two rain delays, adding an extra hour and one minute to the night. After the second delay, Marcus Lemon, who had the night off originally but was forced into the game on the ejection of Joe Jackson, had a two-RBI single to make it 6-0 off Gary starter Jeff McKenzie. Daniel Rockett hit a three-run home run to make the score 9-0 T-Bones off reliever Braulio Torres-Perez. Lemon later added another RBI single in the seventh, and Kevin Keyes added a ninth inning solo homer for Kansas City to make the score an 11-0 final. The T-Bones scored at least 10 runs for the fourth time on that road trip. Kansas City starter Calvin Drummond threw four scoreless innings but did not return after the second rain delay, and the game ended 9-0, in favor of Kansas City. 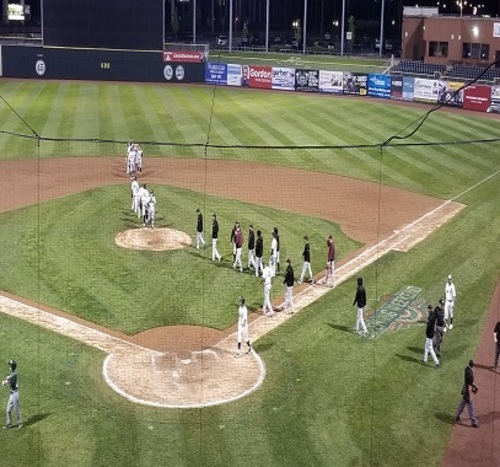 The T-Bones pen of Rich Mascheri, Aaron Brooks, Kamakani Usui, Cody Winiarski and Grant Sides tossed an inning each of scoreless relief to earn the club's first shut out of the season. The win went to Mascheri (1-0) while the loss was charged to McKenzie (0-2). So #9 included two non-traditional double plays and an inside-the-park home run on the anniversary of the last T-Bones inside-the-park homer. What great baseball irony! Add some rain delays in what would normally be a ho hum 11-0 win, but this crazy game earned the ninth game on my list.